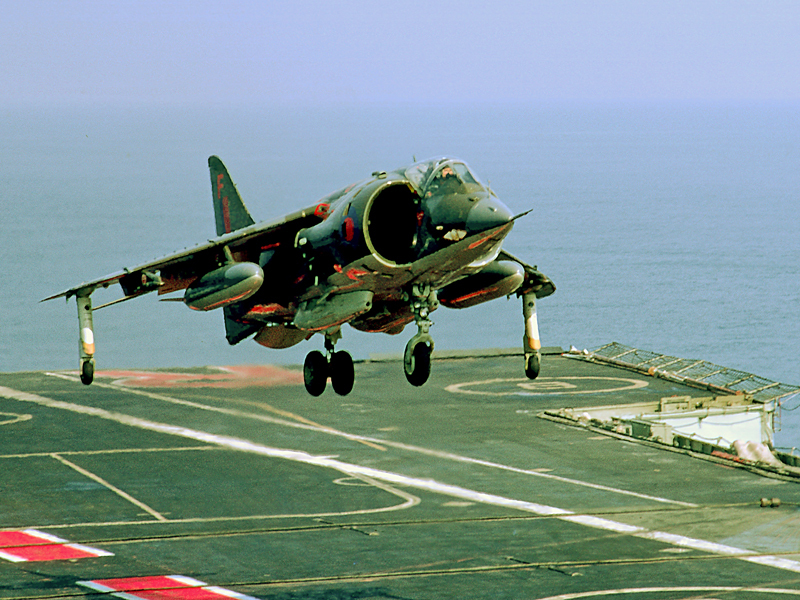 Another couple of shots, the first a Buccaneer about to catch a wire. Shot with an SRT101 with Tamron 135 on Agfa CT-18. This really how the colours are in Arctic light. This was taken during NATO Exercise Northern Wedding in October 1970. I had very few pieces of glass at this time just the one camera with its standard f1.7 Rokkor 55mm and the Tamron. I had to wait for our exit from the Med' at the end of the year when we called in a Gib. I arranged a money transfer from my UK account to a bank in Gib so that I could go camera shopping, money transfers were also a different ball game in those days. Picked up another SRT101 with f1.4 Rokkor 57mm, a 28mm Rokkor f3.5 and a Polarising filter for the 57mm Rokkor all for about half the cost of that first SRT101 purchased in UK. As a Phantom engineer I would often be sitting in a Phantom test running engines where those two at right can be seen in the above shot. If carrying out full power or after-burner tests the 'Island' would request that we throttle back to idle until the recovery was complete. Later, it was deemed to hazardous to have people in that area during recovery operations. It was quite something to be sat out there in a Phantom and have other Phantoms and Buccaneers flash past the nose as they came aboard. The next shot is of an Phantom leaving the waist catapult of the Ark, Rokkor 28mm f3.5. This was taken from the cable deck up in the bows through one of the side apertures in that area. Those who have seen pictures of British aircraft carriers of the period will have noticed these apertures in the for'ard hull. The cable deck was very much a working deck and often out of bounds to those not charged to work there, also it could often be awash as the carrier dipped its nose. Being not along for the cruise, I had one opportunity to visit this deck to get shots. At this time I knew that a detail of two Phantoms were planned for launching so I set about trying to get shots with a touch of motion blur. For the first I settled on a shutter speed of 1/30th with the second planned for 1/60th (with a future plan to visit again for a 1/125th shot). Unfortunately the second Phantom went U/S (unserviceable) after start-up and so never launched and I never did get another opportunity. As it was, I had to listen very carefully for the engine noise, and using the previous launch of a Buccaneer as a timing gauge I had to judge at what moment the aircraft would appear, shoot and hope. Wow - more fabulous pictures Lionel. That one of the Phantom taking off is incredible - the Wessex in the background is just icing on the cake. It is also very interesting to hear the background to the shots. When is the book coming out ? Birma wrote: Wow - more fabulous pictures Lionel. That one of the Phantom taking off is incredible - the Wessex in the background is just icing on the cake. Book, what book? Don't tell the wife. As it happens some of my pic's have already appeared in a book, 'Phoenix Squadron' by Rowland White. That's the aircraft carrier the UK Government should have retained complete with as many Phantoms as possible for the Falklands War in 1982. What a difference that would have made. The Argies would have been wiped out in no time. The Phantoms would have dominated the sky. I would not have wanted to fly a Hawk with these aircraft about. If the UK had to do something like this today we couldn't even send Sea-Harriers (which were still pretty remarkable aircraft ). Birma wrote: If the UK had to do something like this today we couldn't even send Sea-Harriers (which were still pretty remarkable aircraft ). That's the problem with downsizing the military in a still - dangerous world! alphaomega wrote: That's the aircraft carrier the UK Government should have retained complete with as many Phantoms as possible for the Falklands War in 1982. What a difference that would have made. The Argies would have been wiped out in no time. The Phantoms would have dominated the sky. I would not have wanted to fly a Hawk with these aircraft about. I couldn't agree more and I still have very strong feelings about that conflict. To be sure the Phantoms would have been a strong deterrent and the Buccaneers could have cratered airbases ashore. After all a runway is rather a larger target than the moving 'splash' being towed behind the Ark. I recall whilst in the Caribbean a Russian Sverdlov class cruiser was closing on Ark whilst 809 and 892 were having a bash at the splash target with rockets and bombs. Watching from the flight deck one could see a twinkle in the distance as a Bucc' came in on the deck and climbed tossing a bomb at the splash as it did so. Which was a very near miss. The next Bucc' repeated the manoeuvre but managed to miss the splash by some putting it nearer the Sverdlov. The Sverdlov sheered off. What we missed down south was the Gannet AEW. That was a big Achilles heel allowing the opposition to get in close and dangerous. If Ark had been capable of deploying to the South Atlantic with her air group in 82 then I don't think the Argentines would have tried anything at all. Here is an image of one of the three Harrier F1s from No 1 Squadron RAF that came aboard Ark early in 1971 for a few days. The RAF techs that joined us in our mess-deck under the waist catapult under the angled deck, quite near the JBDs (jet blast deflectors - water cooled), hold down and landing projector sight, had their eyes opened. Minolta SRT101, Tamron 135mm, Kodachrome II 25ASA. Cdr. Nigel 'Sharkey' Ward DSC, AFC, who was CO of 801 Harriers in 1982 was a pilot on 892 Phantoms during my time. That's a great picture of the early Harrier on a carrier deck. There can't be many pictures of this around. 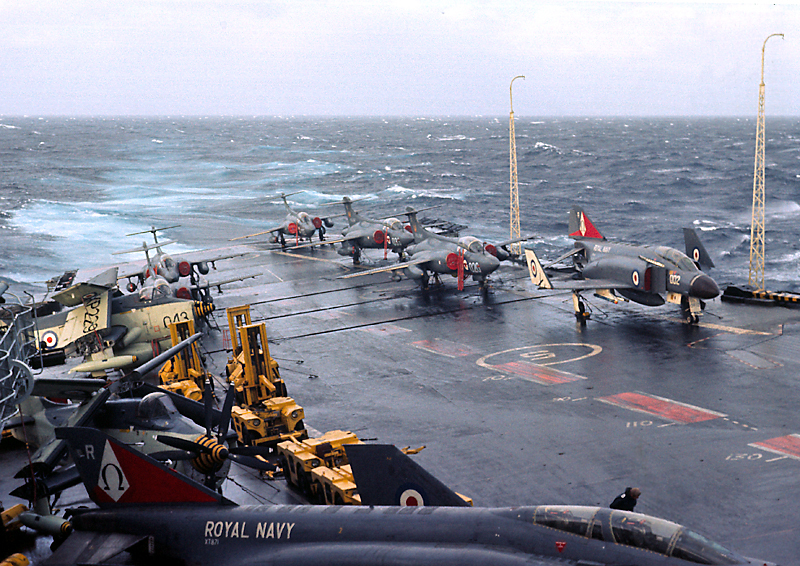 Birma wrote: That's a great picture of the early Harrier on a carrier deck. There can't be many pictures of this around. Thanks Birma. See that deck extension right background, known as Fly 4 to us, that is one position where we could tie down a Phantom for full power and afterburner test runs. There was a fitting in the deck into which could be placed a tie down fixing to which was attached a chain with a special fitting at the end. That fitting was designed to fit into the throat of the arrester hook (or deck hook in our idiom) which would have been extended for the purpose, released from its up-lock. 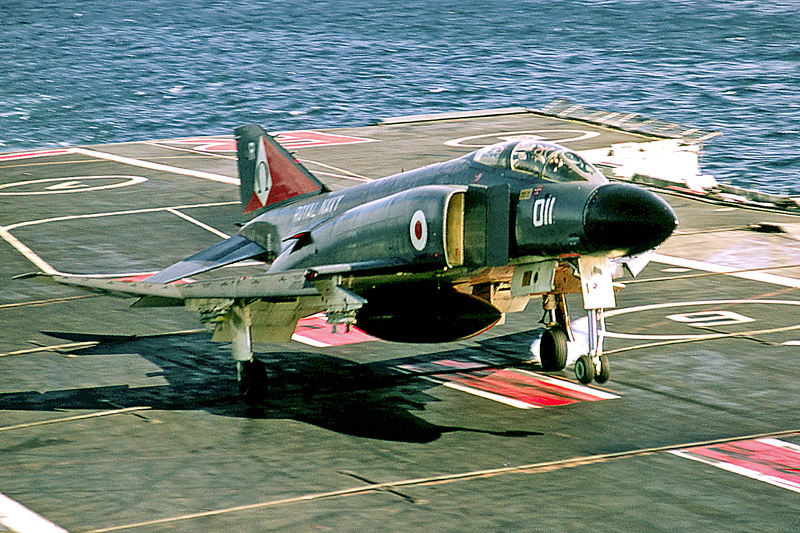 The Phantom would then be drawn forward by a flight deck tractor to tension the chain. Chocks and lashings would then be added as per normal. 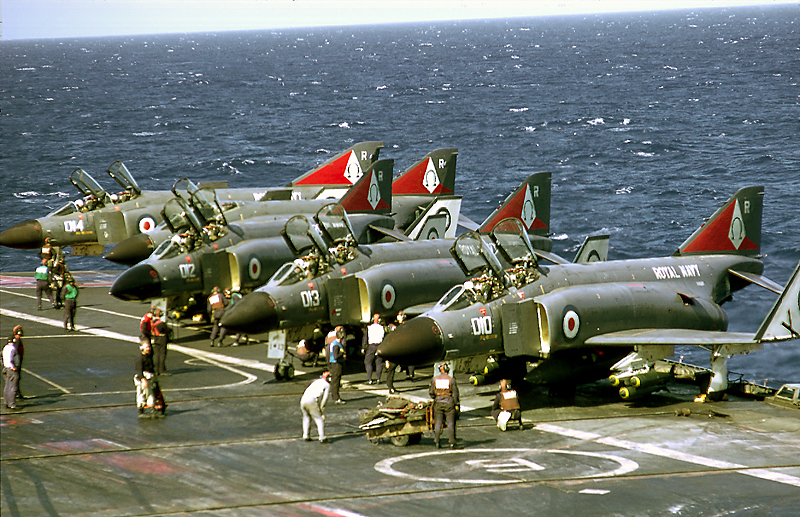 I once, in the early hours whilst testing the afterburner rapid light up of a newly fitted engine of a Phantom in that spot blew some bits of the steel deck surround into the Atlantic. There was a unit in the engine afterburner fuel control system which sensed the air pressure bled of from the engine compressor (which switched between 7th and 12th stage according to flap and power settings) for leading and trailing edge flap blow (the BLC sensing unit for boundary layer control). Sometimes this unit would stick and not reduce the fuel to the burner as it should with some flap settings and an over-fuel would occur with the kerosene vapour not lighting up correctly. Thus a vapour cloud of unburned AVCAT would build up before ignition finally occurred with a Whoomapata! The occupant of the cockpit, muggins doing the test runs, would be jerked violently forward as the aircraft lurched under the sudden impetus. The force was to much for some deck fittings. 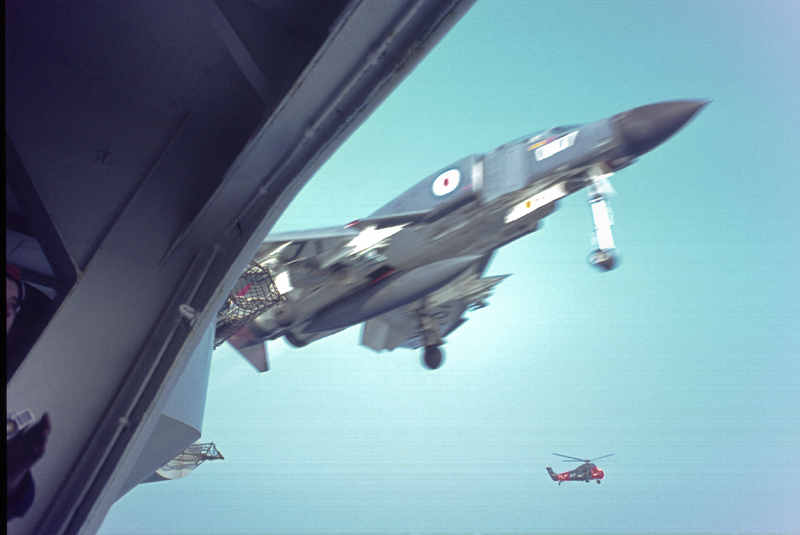 Sometimes things could get a bit rough and on two such occasions I was able to get out on the top of the Flyco (Flying Control) bridge wing, with a lifeline attached, which extended out over the flight deck from the island. 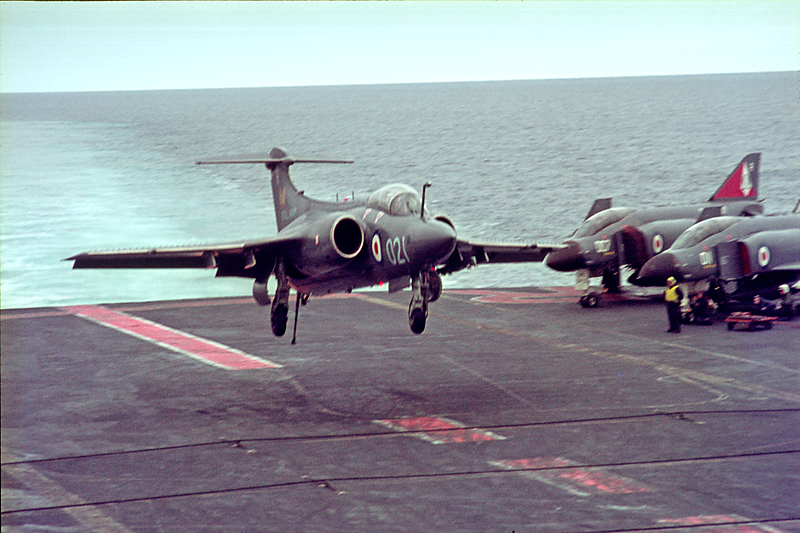 This first one is whilst off Cape Hatteras in the tail of a hurricane as we diverted south to head for the Florida Keyes to get in range of Honduras for a Buccaneer strike pair to be launched to deter Gautamalan aggression. Both SRT101 28mm Rokkor f3.5. This next one was as Ark raced back to UK from the Caribbean in early 1972 to get into dock at Devonport (nr Plymouth) before the navigation pilots went on strike. Ark took a hammering steaming into a huge swell taking it on her port forward quarter with the seas getting in under overhangs and trying to turn the ship over. We had a number of splits opening up in the hull, 20, 30 and 40 feet long with the seas getting in under a boat deck and pushing it upwards crushing the pinnace that was cradled there. Note some of the Bucc's have collapsed undercarriage struts due to the pounding. Even scanned transparencies can be improved using Lightroom, I don't have full Photoshop. I was considering these for 'Blast from the Past' but the coin flipped this way. Fascinating back story and great pictures Lionel. 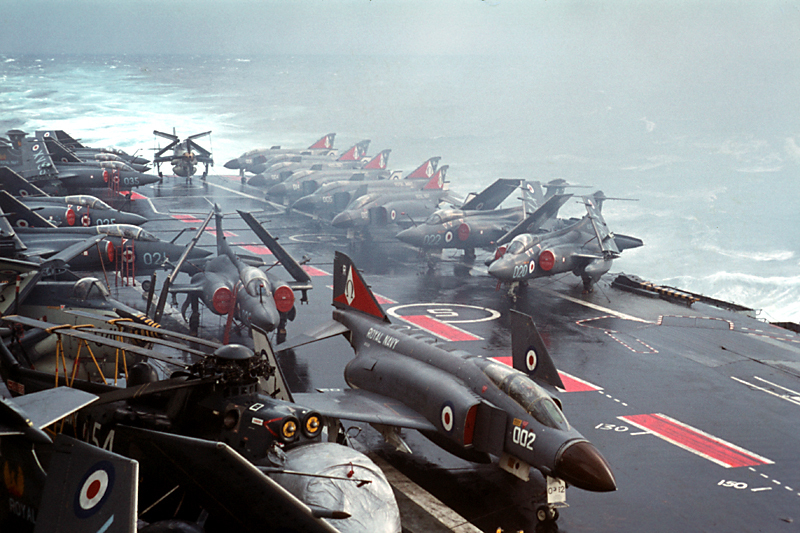 I really like the pictures of the deck crowded with aircraft. I'm amazed that something as big as a carrier can take that sort battering from the sea. The scanned pictures are looking great. You have obviously got a good PP method sorted. Very interesting shots Lionel. I am enjoying them. Dr. Harout wrote: Very interesting shots Lionel. I am enjoying them. Here are a few more, shame these are on a thread who's title no longer indicates some of the content so for continuity I'll continue here. First up, a section of 892 Squadron Phantoms bombed-up and ready for a go at their secondary role as a strike squadron, CAP (Combat Air Patrol) being the primary. The Phantoms were quite successful in the strike role, could used rockets as well, managing to sink an old US destroyer, with compartments welded shut and full of old oil drums, placed as a target such that 809 Buccaneers didn't have a target let alone the accompanying US air group. The Americans went first the next time. The next shot gives an idea of how high that 2 x 20 inch leg extension raised the nose. This to give extra increase of angle of attack for launch from our shorter catapults. 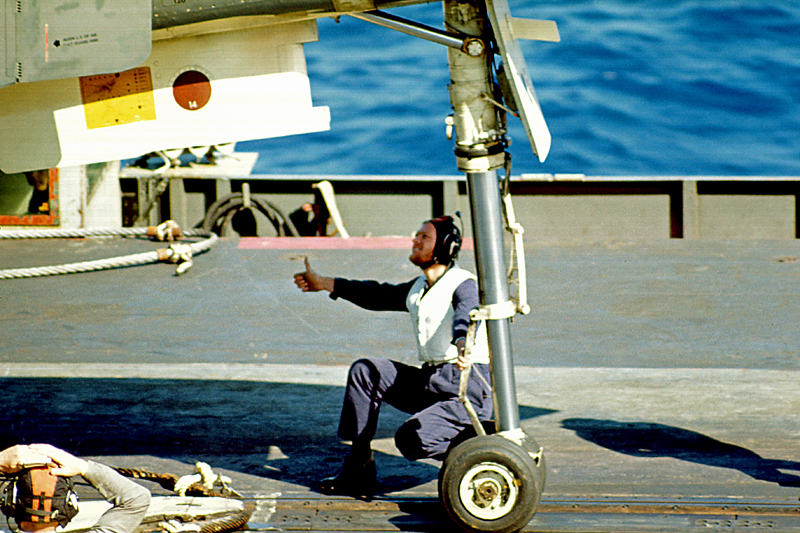 It was this extra extension that required the fitting of larger multi-section water cooled jet blast deflectors to the flight deck at the rear of the catapults. The nose leg shrank under hydraulic pressure when gear-up was selected. If this mode failed then there was an emergency pneumatic system which could be used. This necessarily dumped hydraulic fluid overboard. Because of the need to use the water cooled jet blast deflectors with both engines in afterburner and the leg extended then the ground-run to check out the Nose leg extend caption lights had to be done on the catapult. It was quite an odd feeling sitting perched up there looking over the ship's bows with everything behind going at full bore whilst carrying out such a ground run - on the catapult. The next is what would have picked me up if things went pear shaped but I would have been in some trouble as the ejection seat pins would have been in. 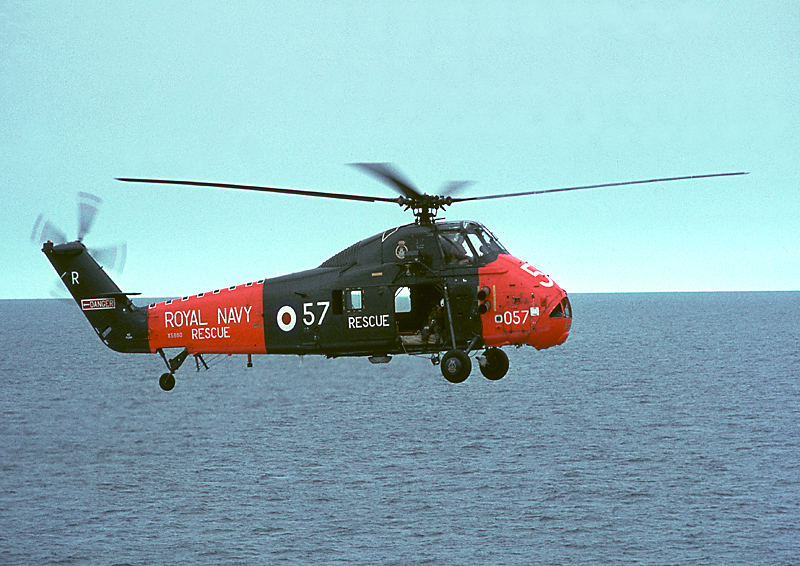 This SAR (search and rescue) Wessex helicopter was the successor to the Whirlwind and even earlier Dragonfly on 'Plane Guard' in the event of a 'ditching' (or 'float test' in our idiom - they always failed). Escorts, destroyers or frigates, would act as 'Plane Guard' in earlier times or unavailability of a 'helo, otherwise it would have been a case of 'Away sea-boats crew'. Last edited by Omega892 on Sun May 19, 2013 5:08 pm, edited 1 time in total. Fabulous picture as always Lionel, with equally interesting back story. Those Phantoms look like they mean serious business! Birma wrote: Fabulous picture as always Lionel, with equally interesting back story. Those Phantoms look like they mean serious business! Yes green with a yellow band = real live HE bombs. I must have been mad signing up to live and work on a floating combined bomb dump and fuel store. Last edited by Omega892 on Mon May 20, 2013 3:53 pm, edited 1 time in total. I love all these photos and stories, just brilliant. I just started photographing aircraft seriously when they retired the mighty F4K from RN service so don't have any photos of them or infact RN Buccs. I remember watching a live F4 scramble from Leuchars, just awesome. Only a Frightning was in the same league.